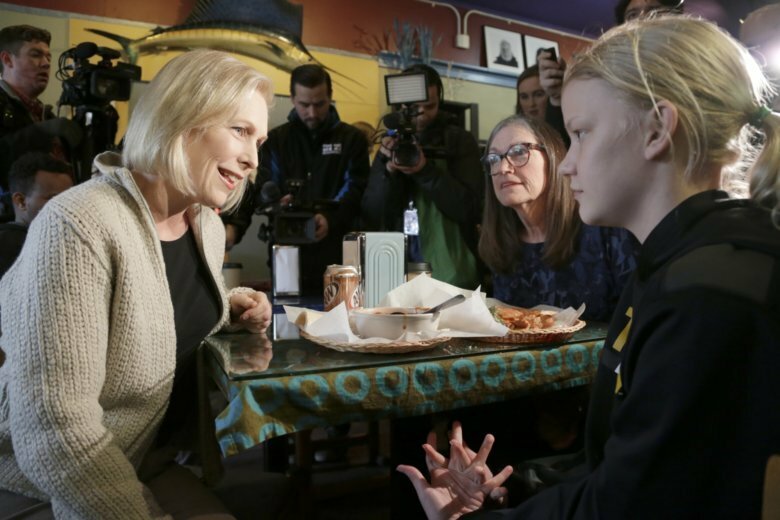 SIOUX CITY, Iowa (AP) — New York Sen. Kirsten Gillibrand introduced herself to Iowa Democrats as a commonsense fighter for family and children issues as she made her first visit to the early-voting state as a 2020 presidential prospect. Unlike some of her potential rivals, Gillibrand was starting from scratch in a state where few party activists have a strong impression of her and where some say the lawmaker is known more for the criticism she’s received. Gillibrand, who announced her intentions to run on “The Late Show with Stephen Colbert” on Tuesday, wasted little time getting to the state where the 2020 caucuses launch the presidential selection process. Gillibrand initially positioned herself more in line with the conservative U.S. House district she represented before 2009, when she replaced Hillary Clinton as New York’s junior senator. Likewise, she was asked why she was the first public advocate for Democrat Al Franken of Minnesota to resign from the Senate. Gillibrand has faced withering criticism from Democrats who said Franken, who resigned in December 2017 after allegations by women that he had groped them, had done far less than what other men have been accused of doing, chiefly President Donald Trump, though Trump has denied all allegations of sexual impropriety. “I totally support her calling him out,” she said. Gillibrand was one of the few prominent 2020 Democrats who attended a Women’s March event this year as the movement faced anti-Semitism charges that have plagued its national leadership team. But the senator said the controversy wouldn’t disrupt her commitment to the march’s broader mission. Gillibrand also praised Iowa voters for sending two women represent the state in Congress. “This is what changing the face of leadership looks like,” she said Saturday. Gillibrand’s Iowa trip was the beginning of her journey to introduce herself to more Americans outside New York, which she has represented in Washington since 2006. She has distinguished herself with her outspoken opposition to Trump and her forceful advocacy for victims of sexual assault and harassment. New Jersey Sen. Cory Booker, for instance, wowed hundreds of party activists at the Iowa Democratic Party’s annual fall fundraising banquet in October. California Sen. Kamala Harris lit up a crowd in Iowa City and met with influential female candidates and activists in suburban Des Moines. Massachusetts Sen. Elizabeth Warren beat a path to the state quickly this month after announcing the formation of an exploratory committee Dec. 31. Gillibrand’s announcement and quickly planned Iowa trip followed what influential Iowa Democrats agreed was a productive trip for Warren, who drew hundreds to events in western and central Iowa. Associated Press writer Juana Summers in Des Moines, Iowa, contributed to this report.